This Is How Much House Prices Will Drop - With Proof ! ! ! All over the world, and here in the UK, when house prices are stable, they are linked to average household income (usually 3.7 to 4 times household income), this is also backed by analysts and top fund managers. Banks are now reverting to a mortgage of 3.5 average household income (NOTE mortgage, not property price). According to the Office of National Statistics, the average household income in the UK is £23,500, thus the average price of a house in the UK should be between £86,950 and £94,000. Currently the average UK price is £168,719 (housepricecrash.co.uk), meaning for the UK public to afford to buy our own houses, we must be on an average household income of between £42,179 to £45,600, just under 50% of current levels (better ask for that pay rise). By causality (actions cause reactions), prices must fall to this level, as the banks are only lending to this criteria, no more living beyond your means mortgages, future interest rate rises on the table for the 1st quarter of 2011, etc. This will in turn cause the the market that these mortgages fund to fall in-line with the criteria that finance it, this is with all things, from finance to nature. For example, too many tigers, not enough food, tigers start to die from malnutrition, number of tigers fall and finally balances out to how much food there is available. My own predictions is that prices may well drop below £86,950, but just for a short time due to a momentum effect, and then level out for a time until people get all excited again and the bubble starts over. Just to demonstrate this, I just went to see a house that was on the market for £570,000. The average household income of the people living there is at most £25,000 (I'm not being a snob). The house was bought when the area was cheaper and less popular, so lets be generous and double the household income to £50,000 to compensate. A one car handyman's house who can afford one cheap holiday a year is aiming at a market who earn around £150,000 a year, being the highly paid London senior professional. The house is a dump and remains on the market and is not overpriced compared to others. This house price falls in to the Prime category (not Platinum Prime), thus I see why the forecasts for the Prime and Platinum Prime properties are so glum. History as well is a great predictor for the future, and time and time again history repeats itself, this time won't be any different. So all you hopefuls who own a property mortgaged to the max that are scared of a crash, don't worry, if you hold on and live there for a good few years in your new family home, the bubble will start again and you will get your money back, eventually. Don't ask me when, I don't have a crystal ball, all I can say is be patient. You can't just say that house prices should be average salary x 3.5. Don't forget that people (even FTB) also buy houses with cash/part-cash. Also doesn't take into account the fact that the low end of the household income scale (benefits, minimum wage earners) aren't and weren't ever in a position to buy their own place. You really need to be discarding the lower quartile of household incomes and then re-examining the data. And people get joint-income multipliers now too. If I think back to house price/income ratios in 1994 compared to today, a 30% drop from here is the most we could hope for, odds are it's going to be less though. 1. Average household income is about 30k, you have cited average income per person. 2. The 3.5 thing is simply the long term average for the whole of the UK. That is all. It is an indication of fair value for the whole of the UK. 3. It does not follow from that if a house costs X then average salary in the area should be X/3.5. People are not buying houses for 3.5 times their salary on a 100% mortgage. Good post. I fully agree with your general principle, that prices to earnings is the main long term indicator/predictor. And I agree that prices are still too high, and should, at some point, fall. "Gravity always wins" after all. I'm just not sure prices will fall by that much. I think they should fall by 20-30% in the next 2-3 years, in real terms (say 15% nominal, plus 10% masked by inflation). Because monthly affordability depends on interest rates levels. They should go up in the next few years, but we can't be sure if they will go as high as the 1990s peak (it pushed down the historical prices to earnings ratio). Though if we do have very high interest rates, then yes, you could be right. Good post. I fully agree with your general principle, that prices to earnings is the main long term indicator/predictor. And I agree that prices are still too high, and should, at some point, fall. It's worth remembering that the VAT rise which comes in on 4th January 2011 is effectively going to reduce the average person's earnings next year by £425 compared to this year. So it remains to be seen whether everyone is going to be demanding a £425 pay rise (and getting it), in which case it's situation-normal. Figures out today for jobs suggests wages won't be rising though. "Growth in pay also continued to slow"
Good point. And it should also push up inflation a little, and this will increase the pressure on the BoE to increase rates. Well one of your facts is wrong, I know RBS for example are lending far more than 3.5x individual income (or 2-2.75*joint). Myself and OH were offered 260k loan when we earn a combined 58k. There is every possibility that in the next 5years one of us could lose our income through little feet, redundency, mental health breakdown or another. You cant simply apply averages and say thats what that house should be worth, there's thousands of micromarkets. Also as mentioned, there will be people who will never be able to own their own home either because they don't want to or can't. You are right in the fact that it is credit controlling prices. Credit will determine what house prices are and peoples sentiment and willingness to take that credit on. As i said at the top of the post, there's no shortage of credit. The 20% down in house prices has been caused by the banks requiring a decent deposit (unsurprisingly 25%). When this changes, and it will, go back to 90% mortgages mainstream house prices will rise. sadly. There is one big oversight in your calculations though, the only people paying 100% (or more realistically 90%) of the price of the house with a full mortgage are first time buyers. 2nd and 3rd step homes (or whatever the terminology is) will be using the equity from the previous house (I'm not talking about price rises, but the money that has been payed down on the mortgage) to contribute to the next. Don't get me wrong, I also believe houses are over priced but to assume that the average house equates to the average wage is too simplistic in my opinion. I stopped reading after this part. Can you explain why it should be between those values? Or is the rest of your proof utter ******** as well? I think it would be really useful if we could get a decent amount of anecdotal evidence of what borrowers are actually being offered in relation to income and deposits. If I put my details into some of the online estimators I am getting answers like 4x on one salary, and nearly 5x combined income on both. Now, I know that is not the same as going into the branch and getting a real offer, but as I know no-one daft enough to be buying a house at the moment, I really have no way of properly evaluating what people are being offered. Maybe I should look on MSE, there's bound to be some people giving out their details. If anyone knows of a thread anywhere dealing with this sort of info, please post a link. Of course now that the recovery is here we could see wages rise with stagnent house prices. I don't think this will happen but it is a possibility. So your assertion of £86,950 wouldn't be right then. Good one. But there is a catch here. If there are enough £500k buyers then the area charateristic will change as well and the neighbours makes it a £500k area. Seen quiet a few areas - 30 years ago, low income area. Towards 2000, those low income gradually being displaced, so it becomes expensive area. of course, if there isn't enough £500k buyer, then those who pay £500k for it will find it impossible to resell it at a later date at that price due to the people around the area. Assumes people take out just as big a mortgage every time they buy a house. Surely in reality people are looking to not keep taking out 3.5x 25 yr mortgages every time? 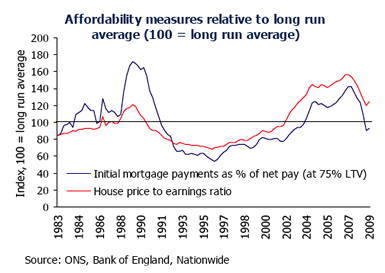 Why should average house prices be directly linked to average income? I would argue that there is much more reason why the price of property should be linked to average net worth. View buying and selling property as a flow of capital, not of income. If you look here, http://www.statistics.gov.uk/CCI/nugget.asp?ID=2338 , median household wealth is between £200K and £300K depending where you are in England. A chart of median property wealth as % median household wealth over time would be interesting. Any links? This dipping below the trend line might tempt me to buy a second house, for when I retire. I am not asking you jplevene, as you don't have a crystal ball, but appreciate your tip to be patient. I'm 36 now so have plenty of time! Edit: Obviously there come a time where a 25 year loan is not going to happen, but this will be circa 40 years old. This raises an interesting point actually - in the "old days" people would get their first mortgage a lot earlier so would have time for more "steps", whereas now only one or two big steps will be possible. Edit-edit: And of course in the past, inflation (by which I mean wage inflation) fast forwarded these steps for "free". These step ups are still in the system hence why older people are living in houses that there is no way they could actually afford at todays prices. It will take a while for this to unwind, but it will do due to no first time buyers being able to support the ponzi. Personally I think the main driving force for price drops will come from retiring baby boomers trying to downsize. This will force prices down from the top downwards as they realise that there is no viable chain underneath them. dont mean to sound stupid but how does VAT affect earnings? 1) Joint incomes are becoming more common (people would rather live the homeowner dream than bring up their kids themselves) so household income would be a more useful indicator. 2) Average salaries have been skewed by the increasingly extreme income outliers (ie the gap between 'rich' and 'poor' is growing) so median wages vs median houseprices would be a better comparison. 3) Even if you were to use median household income vs house price comparison for example, household incomes will be distorted by the effects of various benefits/taxation eg tax credits. For me, the only thing you can be sure of is this - dubious lending practices (eg self cert and IO mortages) have been growing from 2000ish onwards and prices have become increasingly detached from income (however you measure it). Now these practices have pretty much dissapeared and so prices will fall. Effectively is the key word, it will have the same effect as a pay cut of that amount in terms of a person's purchasing power. Income multiples are pointless, its all about how much goes out each month and how much you have left. Thats what drove the 90s crash money left at the end of the month, NOT a mythical salary multiple exceeded, as a percentage of take home average mortgage costs exceeded a single persons total average income in the 90s peak, and we didnt reach this level before Irs were dropped. 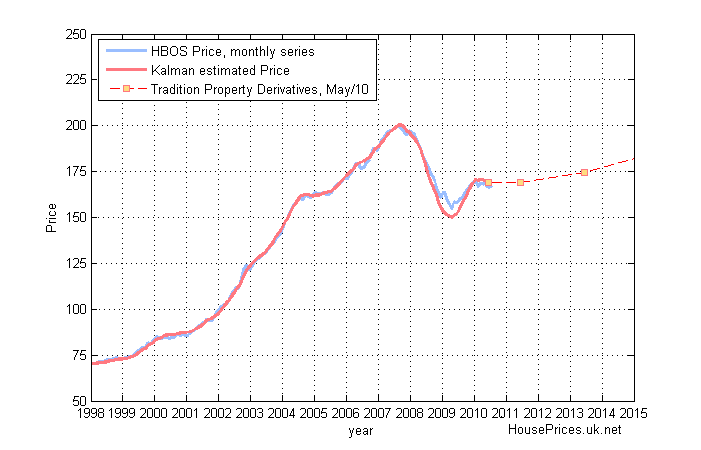 Also remember in the 95 trough prices were incredibly cheap, property was at historical low! The stats are probably grossly distorted by the last ten years. Sound lending would required that a couple is not lent more than 2.5 times household income. Add to that the fact that most people have very little cash and you can comfortably knock off a third to your target price. Income multiples are pointless, its all about how much goes out each month and how much you have left. I complete agree. What I don't see is that if we agree on the above, why wouldn't you be expecting at least a moderate drop in house prices in the next year? Government spending cuts are in place yet. Interest rates are still extremely low. Mortgage demand (especially from FTBers) is heading down. I doubt we'll see the housing apocalypse that some here expect. I do expect the house price low point to be more than ~10% down in real terms and be during the next 18 months.